I'm currently at DebConf 17 in Montréal, back at DebConf for the first time in 10 years (last time was DebConf 7 in Edinburgh). It's great to put names to faces and meet more of my co-developers in person! On Monday I gave a talk entitled “A Debian maintainer's guide to Flatpak”, aiming to introduce Debian developers to Flatpak, and show how Flatpak and Debian (and Debian derivatives like SteamOS) can help each other. It seems to have been quite well received, with people generally positive about the idea of using Flatpak to deliver backports and faster-moving leaf packages (games!) onto the stable base platform that Debian is so good at providing. A video of the talk is available from the Debian Meetings Archive. I've also put up my slides in the DebConf git-annex repository, with some small edits to link to more source code: A Debian maintainer's guide to Flatpak. Source code for the slides is also available from Collabora's git server. I don't think Debian will be going quite as far as Endless any time soon: as Cosimo outlined in the talk right before mine, they deploy their Debian derivative as an immutable base OS with libOSTree, with all the user-installable modules above that coming from Flatpak. That model is certainly an interesting thing to think about for Debian derivatives, though: at Collabora we work on a lot of appliance-like embedded Debian derivatives, with a lot of flexibility during development but very limited state on deployed systems, and Endless' approach seems a perfect fit for those situations. At the GTK hackfest in London (which accidentally became mostly a Flatpak hackfest) I've mainly been looking into how to make D-Bus work better for app container technologies like Flatpak and Snap. Portals: Portal authors need to be able to identify whether the container is being contacted by an uncontained process (running with the user's full privileges), or whether it is being contacted by a contained process (in a container created by Flatpak or Snap). dconf: Currently, a contained app either has full read/write access to dconf, or no access. It should have read/write access to its own subtree of dconf configuration space, and no access to the rest. At the moment, Flatpak runs a D-Bus proxy for each app instance that has access to D-Bus, connects to the appropriate bus on the app's behalf, and passes messages through. That proxy is in a container similar to the actual app instance, but not actually the same container; it is trusted to not pass messages through that it shouldn't pass through. The app-identification mechanism works in practice, but is Flatpak-specific, and has a known race condition due to process ID reuse and limitations in the metadata that the Linux kernel maintains for AF_UNIX sockets. In practice the use of X11 rather than Wayland in current systems is a much larger loophole in the container than this race condition, but we want to do better in future. Meanwhile, Snap does its sandboxing with AppArmor, on kernels where it is enabled both at compile-time (Ubuntu, openSUSE, Debian, Debian derivatives like Tails) and at runtime (Ubuntu, openSUSE and Tails, but not Debian by default). Ubuntu's kernel has extra AppArmor features that haven't yet gone upstream, some of which provide reliable app identification via LSM labels, which dbus-daemon can learn by querying its AF_UNIX socket. However, other kernels like the ones in openSUSE and Debian don't have those. The access-control (AppArmor mediation) is implemented in upstream dbus-daemon, but again doesn't work portably, and is not sufficiently fine-grained or flexible to do some of the things we'll likely want to do, particularly in dconf. After a lot of discussion with dconf maintainer Allison Lortie and Flatpak maintainer Alexander Larsson, I think I have a plan for fixing this. This is all subject to change: see fd.o #100344 for the latest ideas. Each user (uid) has some uncontained processes, plus 0 or more containers. The uncontained processes include dbus-daemon itself, desktop environment components such as gnome-session and gnome-shell, the container managers like Flatpak and Snap, and so on. They have the user's full privileges, and in particular they are allowed to do privileged things on the user's session bus (like running dbus-monitor), and act with the user's full privileges on the system bus. In generic information security jargon, they are the trusted computing base; in AppArmor jargon, they are unconfined. The containers are Flatpak apps, or Snap apps, or other app-container technologies like Firejail and AppImage (if they adopt this mechanism, which I hope they will), or even a mixture (different app-container technologies can coexist on a single system). They are containers (or container instances) and not "apps", because in principle, you could install com.example.MyApp 1.0, run it, and while it's still running, upgrade to com.example.MyApp 2.0 and run that; you'd have two containers for the same app, perhaps with different permissions. Each container has an container type, which is a reversed DNS name like org.flatpak or io.snapcraft representing the container technology, and an app identifier, an arbitrary non-empty string whose meaning is defined by the container technology. For Flatpak, that string would be another reversed DNS name like com.example.MyGreatApp; for Snap, as far as I can tell it would look like example-my-great-app. The container technology can also put arbitrary metadata on the D-Bus representation of a container, again defined and namespaced by the container technology. For instance, Flatpak would use some serialization of the same fields that go in the Flatpak metadata file at the moment. Finally, the container has an opaque container identifier identifying a particular container instance. For example, launching com.example.MyApp twice (maybe different versions or with different command-line options to flatpak run) might result in two containers with different privileges, so they need to have different container identifiers. Processes inside the container must not be allowed to contact the AF_UNIX socket used by the wider, uncontained system - if they could, the dbus-daemon wouldn't be able to distinguish between them and uncontained processes and we'd be back where we started. Instead, they should have the new socket bind-mounted into their container's XDG_RUNTIME_DIR and connect to that, or have the new socket set as their DBUS_SESSION_BUS_ADDRESS and be prevented from connecting to the uncontained socket in some other way. Those familiar with the kdbus proposals a while ago might recognise this as being quite similar to kdbus' concept of endpoints, and I'm considering reusing that name. Along with the socket, the container manager would pass in the container's identity and metadata, and the method would return a unique, opaque identifier for this particular container instance. The basic fields (container technology, technology-specific app ID, container ID) should probably be added to the result of GetConnectionCredentials(), and there should be a new API call to get all of those plus the arbitrary technology-specific metadata. When a process from a container connects to the contained server socket, every message that it sends should also have the container instance ID in a new header field. This is OK even though dbus-daemon does not (in general) forbid sender-specified future header fields, because any dbus-daemon that supported this new feature would guarantee to set that header field correctly, the existing Flatpak D-Bus proxy already filters out unknown header fields, and adding this header field is only ever a reduction in privilege. The reasoning for using the sender's container instance ID (as opposed to the sender's unique name) is for services like dconf to be able to treat multiple unique bus names as belonging to the same equivalence class of contained processes: instead of having to look up the container metadata once per unique name, dconf can look it up once per container instance the first time it sees a new identifier in a header field. For the second and subsequent unique names in the container, dconf can know that the container metadata and permissions are identical to the one it already saw. In principle, we could have the new identification feature without adding any new access control, by keeping Flatpak's proxies. However, in the short term that would mean we'd be adding new API to set up a socket for a container without any access control, and having to keep the proxies anyway, which doesn't seem great; in the longer term, I think we'd find ourselves adding a second new API to set up a socket for a container with new access control. So we might as well bite the bullet and go for the version with access control immediately. In principle, we could also avoid the need for new access control by ensuring that each service that will serve contained clients does its own. However, that makes it really hard to send broadcasts and not have them unintentionally leak information to contained clients - we would need to do something more like kdbus' approach to multicast, where services know who has subscribed to their multicast signals, and that is just not how dbus-daemon works at the moment. If we're going to have access control for broadcasts, it might as well also cover unicast. The plan is that messages from containers to the outside world will be mediated by a new access control mechanism, in parallel with dbus-daemon's current support for firewall-style rules in the XML bus configuration, AppArmor mediation, and SELinux mediation. A message would only be allowed through if the XML configuration, the new container access control mechanism, and the LSM (if any) all agree it should be allowed. By default, processes in a container can send broadcast signals, and send method calls and unicast signals to other processes in the same container. They can also receive method calls from outside the container (so that interfaces like org.freedesktop.Application can work), and send exactly one reply to each of those method calls. They cannot own bus names, communicate with other containers, or send file descriptors (which reduces the scope for denial of service). Obviously, that's not going to be enough for a lot of contained apps, so we need a way to add more access. I'm intending this to be purely additive (start by denying everything except what is always allowed, then add new rules), not a mixture of adding and removing access like the current XML policy language. The container manager can pass a list of rules into the dbus-daemon at the time it attaches the contained server socket, and they'll be allowed. The obvious example is that an org.freedesktop.Application needs to be allowed to own its own bus name. Flatpak apps' implicit permission to talk to portals, and Flatpak metadata like org.gnome.SessionManager=talk, could also be added this way. System or session services that are specifically designed to be used by untrusted clients, like the version of dconf that Allison is working on, could opt-in to having contained apps allowed to talk to them (effectively making them a generalization of Flatpak portals). The simplest such request, for something like a portal, is "allow connections from any container to contact this service"; but for dconf, we want to go a bit finer-grained, with all containers allowed to contact a single well-known rendezvous object path, and each container allowed to contact an additional object path subtree that is allocated by dconf on-demand for that app. Initially, many contained apps would work in the first way (and in particular sockets=session-bus would add a rule that allows almost everything), while over time we'll probably want to head towards recommending more use of the second. We talked about the possibility of using a very similar ruleset to control access to the system bus, as an alternative to the XML rules found in /etc/dbus-1/system.d and /usr/share/dbus-1/system.d. We didn't really come to a conclusion here. Allison had the useful insight that the XML rules are acting like a firewall: they're something that is placed in front of potentially-broken services, and not part of the services themselves (which, as with firewalls like ufw, makes it seem rather odd when the services themselves install rules). D-Bus system services already have total control over what requests they will accept from D-Bus peers, and if they rely on the XML rules to mediate that access, they're essentially rejecting that responsibility and hoping the dbus-daemon will protect them. The D-Bus maintainers would much prefer it if system services took responsibility for their own access control (with or without using polkit), because fundamentally the system service is always going to understand its domain and its intended security model better than the dbus-daemon can. Analogously, when a network service listens on all addresses and accepts requests from elsewhere on the LAN, we sometimes work around that by protecting it with a firewall, but the optimal resolution is to get that network service fixed to do proper authentication and access control instead. We discussed the possibility of moving towards a model where the daemon uid to be allowed is written in the .service file, together with an opt-in to "modern D-Bus access control" that makes the "firewall" unnecessary; after some flag day when all significant system services follow that pattern, dbus-daemon would even have the option of no longer applying the "firewall" (moving to an allow-by-default model) and just refusing to activate system services that have not opted in to being safe to use without it. However, the "firewall" also protects system bus clients, and services like Avahi that are not bus-activatable, against unintended access, which is harder to solve via that approach; so this is going to take more thought. For system services' clients that follow the "agent" pattern (BlueZ, polkit, NetworkManager, Geoclue), the correct "firewall" configuration is more complicated. At some point I'll try to write up a best-practice for these. At the moment, it's harder than it needs to be to provide non-trivial access control on the system bus, because on receiving a method call, a service has to remember what was in the method call, then call GetConnectionCredentials() to find out who sent it, then only process the actual request when it has the information necessary to do access control. Allison and I had hoped to resolve this by adding new D-Bus message header fields with the user ID, the LSM label, and other interesting facts for access control. These could be "opt-in" to avoid increasing message sizes for no reason: in particular, it is not typically useful for session services to receive the user ID, because only one user ID is allowed to connect to the session bus anyway. Unfortunately, the dbus-daemon currently lets unknown fields through without modification. With hindsight this seems an unwise design choice, because header fields are a finite resource (there are 255 possible header fields) and are defined by the D-Bus Specification. The only field that can currently be trusted is the sender's unique name, because the dbus-daemon sets that field, overwriting the value in the original message (if any). To make it safe to rely on the new fields, we would have to make the dbus-daemon filter out all unknown header fields, and introduce a mechanism for the service to check (during connection to the bus) whether the dbus-daemon is sufficiently new that it does so. If connected to an older dbus-daemon, the service would not be able to rely on the new fields being true, so it would have to ignore the new fields and treat them as unset. The specification is sufficiently vague that making new dbus-daemons filter out unknown header fields is a valid change (it just says that "Header fields with an unknown or unexpected field code must be ignored", without specifying who must ignore them, so having the dbus-daemon delete those fields seems spec-compliant). This all seemed fine when we discussed it in person; but GDBus already has accessors for arbitrary header fields by numeric ID, and I'm concerned that this might mean it's too easy for a system service to be accidentally insecure: It would be natural (but wrong!) for an implementor to assume that if g_message_get_header (message, G_DBUS_MESSAGE_HEADER_FIELD_SENDER_UID) returned non-NULL, then that was guaranteed to be the correct, valid sender uid. As a result, fd.o #100317 might have to be abandoned. I think more thought is needed on that one. .desktop file categories and how to adapt them for AppStream, perhaps involving using the .desktop vocabulary but relaxing some of the hierarchy restrictions so they behave more like "tags"
More notes are available from the GNOME wiki. The GTK hackfest was organised by GNOME and hosted by Red Hat and Endless. My attendance was sponsored by Collabora. Thanks to all the sponsors and organisers, and the developers and organisations who attended. 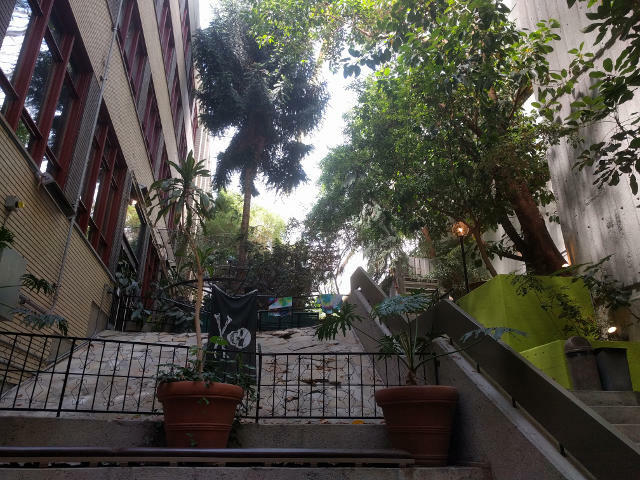 I'm back from the GTK hackfest in Toronto, Canada and mostly recovered from jetlag, so it's time to write up my notes on what we discussed there. Despite the hackfest's title, I was mainly there to talk about non-GUI parts of the stack, and technologies that fit more closely in what could be seen as the freedesktop.org platform than they do in GNOME. In particular, I'm interested in Flatpak as a way to deploy self-contained "apps" in a freedesktop-based, sandboxed runtime environment layered over the Universal Operating System and its many derivatives, with both binary and source compatibility with other GNU/Linux distributions. I'm mainly only writing about discussions I was directly involved in: lots of what sounded like good discussion about the actual graphics toolkit went over my head completely :-) More notes, mostly from Matthias Clasen, are available on the GNOME wiki. We spent some time discussing Flatpak's portals, mostly on Tuesday. These are the components that expose a subset of desktop functionality as D-Bus services that can be used by contained applications: they are part of the security boundary between a contained app and the rest of the desktop session. Android's intents are a similar concept seen elsewhere. While the portals are primarily designed for Flatpak, there's no real reason why they couldn't be used by other app-containment solutions such as Canonical's Snap. One major topic of discussion was their overall design and layout. Most portals will consist of a UX-independent part in Flatpak itself, together with a UX-specific implementation of any user interaction the portal needs. For example, the portal for file selection has a D-Bus service in Flatpak, which interacts with some UX-specific service that will pop up a standard UX-specific "Open" dialog — for GNOME and probably other GTK environments, that dialog is in (a branch of) GTK. A design principle that was reiterated in this discussion is that the UX-independent part should do as much as possible, with the UX-specific part only carrying out the user interactions that need to comply with a particular UX design (in the GTK case, GNOME's design). This minimizes the amount of work that needs to be redone for other desktop or embedded environments, while still ensuring that the other environments can have their chosen UX design. In particular, it's important that, as much as possible, the security- and performance-sensitive work (such as data transport and authentication) is shared between all environments. The aim is for portals to get the user's permission to carry out actions, while keeping it as implicit as possible, avoiding an "are you sure?" step where feasible. For example, if an application asks to open a file, the user's permission is implicitly given by them selecting the file in the file-chooser dialog and pressing OK: if they do not want this application to open a file at all, they can deny permission by cancelling. Similarly, if an application asks to stream webcam data, the UX we expect is for GNOME's Cheese app (or a similar non-GNOME app) to appear, open the webcam to provide a preview window so they can see what they are about to send, but not actually start sending the stream to the requesting app until the user has pressed a "Start" button. When defining the API "contracts" to be provided by applications in that situation, we will need to be clear about whether the provider is expected to obtain confirmation like this: in most cases I would anticipate that it is. One security trade-off here is that we have to have a small amount of trust in the providing app. For example, continuing the example of Cheese as a webcam provider, Cheese could (and perhaps should) be a contained app itself, whether via something like Flatpak, an LSM like AppArmor or both. If Cheese is compromised somehow, then whenever it is running, it would be technically possible for it to open the webcam, stream video and send it to a hostile third-party application. We concluded that this is an acceptable trade-off: each application needs to be trusted with the privileges that it needs to do its job, and we should not put up barriers that are easy to circumvent or otherwise serve no purpose. The main (only?) portal so far is the file chooser, in which the contained application asks the wider system to show an "Open..." dialog, and if the user selects a file, it is returned to the contained application through a FUSE filesystem, the document portal. The reference implementation of the UX for this is in GTK, and is basically a GtkFileChooserDialog. The intention is that other environments such as KDE will substitute their own equivalent. GNOME on Wayland currently has a problem with environment variables: there are some traditional ways to set environment variables for X11 sessions or login shells using shell script fragments (/etc/X11/Xsession.d, /etc/X11/xinit/xinitrc.d, /etc/profile.d), but these do not apply to Wayland, or to noninteractive login environments like cron and systemd --user. We are also keen to avoid requiring a Turing-complete shell language during session startup, because it's difficult to reason about and potentially rather inefficient. Some uses of environment variables can be dismissed as unnecessary or even unwanted, similar to the statement in Debian Policy §9.9: "A program must not depend on environment variables to get reasonable defaults." However, there are two common situations where environment variables can be necessary for proper OS integration: search-paths like $PATH, $XDG_DATA_DIRS and $PYTHONPATH (particularly necessary for things like Flatpak), and optionally-loaded modules like $GTK_MODULES and $QT_ACCESSIBILITY where a package influences the configuration of another package. There is a stopgap solution in GNOME's gdm display manager, /usr/share/gdm/env.d, but this is gdm-specific and insufficiently expressive to provide the functionality needed by Flatpak: "set XDG_DATA_DIRS to its specified default value if unset, then add a couple of extra paths". pam_env comes closer — PAM is run at every transition from "no user logged in" to "user can execute arbitrary code as themselves" — but it doesn't support .d fragments, which are required if we want distribution packages to be able to extend search paths. pam_env also turns off per-user configuration by default, citing security concerns. I'll write more about this when I have a concrete proposal for how to solve it. I think the best solution is probably a PAM module similar to pam_env but supporting .d directories, either by modifying pam_env directly or out-of-tree, combined with clarifying what the security concerns for per-user configuration are and how they can be avoided. On Windows and OS X, various GLib APIs automatically discover where the application binary is located and use search paths relative to that; for example, if C:\myprefix\bin\app.exe is running, GLib might put C:\myprefix\share into the result of g_get_system_data_dirs(), so that the application can ask to load app/data.xml from the data directories and get C:\myprefix\share\app\data.xml. We would like to be able to do the same on Linux, for example so that the apps in a Flatpak or Snap package can be constructed from RPM or dpkg packages without needing to be recompiled for a different --prefix, and so that other third-party software packages like the games on Steam and gog.com can easily locate their own resources. Relatedly, there are currently no well-defined semantics for what happens when a .desktop file or a D-Bus .service file has Exec=./bin/foo. The meaning of Exec=foo is well-defined (it searches $PATH) and the meaning of Exec=/opt/whatever/bin/foo is obvious. When this came up in D-Bus previously, my assertion was that the meaning should be the same as in .desktop files, whatever that is. We agreed to propose that the meaning of a non-absolute path in a .desktop or .service file should be interpreted relative to the directory where the .desktop or .service file was found: for example, if /opt/whatever/share/applications/foo.desktop says Exec=../../bin/foo, then /opt/whatever/bin/foo would be the right thing to execute. While preparing a mail to the freedesktop and D-Bus mailing lists proposing this, I found that I had proposed the same thing almost 2 years ago... this time I hope I can actually make it happen! On the way to the hackfest, and while the discussion moved to topics that I didn't have useful input on, I spent some time fixing up the Debian packaging for Flatpak and its dependencies. In particular, I did my first upload as a co-maintainer of bubblewrap, uploaded ostree to unstable (with the known limitation that the grub, dracut and systemd integration is missing for now since I haven't been able to test it yet), got most of the way through packaging Flatpak 0.6.5 (which I'll upload soon), cherry-picked the right patches to make ostree compile on Debian 8 in an effort to make backports trivial, and spent some time disentangling a flatpak test failure which was breaking the Debian package's installed-tests. I'm still looking into ostree test failures on little-endian MIPS, which I was able to reproduce on a Debian porterbox just before the end of the hackfest. I also had some useful conversations with developers from Endless, who recently opened up a version of their OSTree build scripts for public access. Hopefully that information brings me a bit closer to being able to publish a walkthrough for how to deploy a simple Debian derivative using OSTree (help with that is very welcome of course!). The life-cycle of GTK releases has already been mentioned here and elsewhere, and there are some interesting responses in the comments on my earlier blog post. It's important to note that what we discussed at the hackfest is only a proposal: a hackfest discussion between a subset of the GTK maintainers and a small number of other GTK users (I am in the latter category) doesn't, and shouldn't, set policy for all of GTK or for all of GNOME. I believe the intention is that the GTK maintainers will discuss the proposals further at GUADEC, and make a decision after that. As I said before, I hope that being more realistic about API and ABI guarantees can avoid GTK going too far towards either of the possible extremes: either becoming unable to advance because it's too constrained by compatibility, or breaking applications because it isn't constrained enough. The current situation, where it is meant to be compatible within the GTK 3 branch but in practice applications still sometimes break, doesn't seem ideal for anyone, and I hope we can do better in future. Allison Lortie has provoked a lot of comment with her blog post on a new proposal for how GTK is versioned. Here's some more context from the discussion at the GTK hackfest that prompted that proposal: there's actually quite a close analogy in how new Debian versions are developed. In particular, the perceived cost of doing a proper ABI break (a fully parallel-installable GTK 4) means there's a strong temptation to make changes that don't actually remove or change C symbols, but are clearly an ABI break, in the sense that an application that previously worked and was considered correct no longer works. A prominent recent example is the theming changes in GTK 3.20: the ABI in terms of functions available didn't change, but what happens when you call those functions changed in an incompatible way. This makes GTK hard to rely on for applications outside the GNOME release cycle, which is a problem that needs to be fixed (without stopping development from continuing). The goal of the plan we discussed today is to decouple the latest branch of development, which moves fast and sometimes breaks API, from the API-stable branches, which only get bug fixes. This model should look quite familiar to Debian contributors, because it's a lot like the way we release Debian and Ubuntu. In Debian, at any given time we have a development branch (testing/unstable) - currently "stretch", the future Debian 9. We also have some stable branches, of which the most recent are Debian 8 "jessie" and Debian 7 "wheezy". Different users of Debian have different trade-offs that lead them to choose one or the other of these. Users who value stability and want to avoid unexpected changes, even at a cost in terms of features and fixes for non-critical bugs, choose to use a stable release, preferably the most recent; they only need to change what they run on top of Debian for OS API changes (for instance webapps, local scripts, or the way they interact with the GUI) approximately every 2 years, or perhaps less often than that with the Debian-LTS project supporting non-current stable releases. Meanwhile, users who value the latest versions and are willing to work with a "moving target" as a result choose to use testing/unstable. The GTK analogy here is really quite close. In the new versioning model, library users who value stability over new things would prefer to use a stable-branch, ideally the latest; library users who want the latest features, the latest bug-fixes and the latest new bugs would use the branch that's the current focus of development. In practice we expect that the latter would be mostly GNOME projects. There's been some discussion at the hackfest about how often we'd have a new stable-branch: the fastest rate that's been considered is a stable-branch every 2 years, similar to Ubuntu LTS and Debian, but there's no consensus yet on whether they will be that frequent in practice. How many stable versions of GTK would end up shipped in Debian depends on how rapidly projects move from "old-stable" to "new-stable" upstream, how much those projects' Debian maintainers are willing to patch them to move between branches, and how many versions the release team will tolerate. Once we reach a steady state, I'd hope that we might have 1 or 2 stable-branched versions active at a time, packaged as separate parallel-installable source packages (a lot like how we handle Qt). GTK 2 might well stay around as an additional active version just from historical inertia. The stable versions are intended to be fully parallel-installable, just like the situation with GTK 1.2, GTK 2 and GTK 3 or with the major versions of Qt. For the "current development" version, I'd anticipate that we'd probably only ship one source package, and do ABI transitions for one version active at a time, a lot like how we deal with libgnome-desktop and the evolution-data-server family of libraries. Those versions would have parallel-installable runtime libraries but non-parallel-installable development files, again similar to libgnome-desktop. At the risk of stretching the Debian/Ubuntu analogy too far, the intermediate "current development" GTK releases that would accompany a GNOME release are like Ubuntu's non-LTS suites: they're more up to date than the fully stable releases (Ubuntu LTS, which has a release schedule similar to Debian stable), but less stable and not supported for as long. Hopefully this plan can meet both of its goals: minimize breakage for applications, while not holding back the development of new APIs.